FIT booking apply for Maximum 5 rooms & below only. FREE benefit claim from hotel upon check in and no refund for any unused for free benefit. Free Krabi city tour + Free Duck Noodle will be conducted either on Arrival (Must Before 1330hrs) Or Departure Day (Must After 1400hrs) depending on your flight schedule and arrival / departure time. Tour guide will reconfirm with passenger once arrive. For flight Late Arrival & Early Departure, city tour will AUTO FORFEITED without refund. For Muslim passenger's, FREE duck noodle meal will be replaced with Seafood Fried Rice. ➤ Upon arrival, you will be received by our representatives at the arrival hall. You will then be transferred to the hotel. ➤ Check in and an overnight stay at the hotel. ➤ After breakfast, you will proceed to an island tour via a Long Tail Boat for snorkeling and swimming with picnic lunch on board. You will visit places such as the Tub Island, the Chicken Island (named after the mountain shape as a chicken), the Mo Island and the Poda Island. ➤ Continue to visit Railey Beach with its legend of the Lady Princess Cave and its love story. Railey Beach also is the world famous rock climbing place. ➤ After breakfast, you will be free at own lesisure. ➤ Afternoon, proceed for Romantic Sunset Cruise. Cruising to West region of Railey Beach, Peninsula and heading to local island to enjoy the spectacular sunset views. ➤ After tour, return to hotel and overnight at hotel. 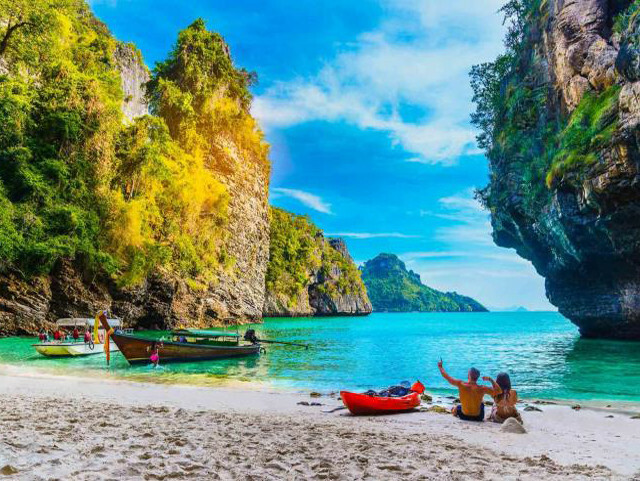 ➤ After breakfast, you will proceed for Krabi City Tour and visit Wat Thum Sir 'Tiger Cave' Temple, pass by Krabi Town, Fruits Market, Vogue Shopping Mall. ➤ Continue visit Outlet Premium Shopping OR Marine Fish Farm where you get to see the collection of all kinds of fishes from the Andaman Sea . You will stopover to buy some Krabi famous local products. Enjoy Krabi famous duck noodle with herbal soup / seafood fried rice. ➤ You will then be transferred to the airport for your onward flight.